The U.S. District Court in Anchorage issued a decision Friday on the Islands Wolf lawsuit centered in Southeast Alaska. 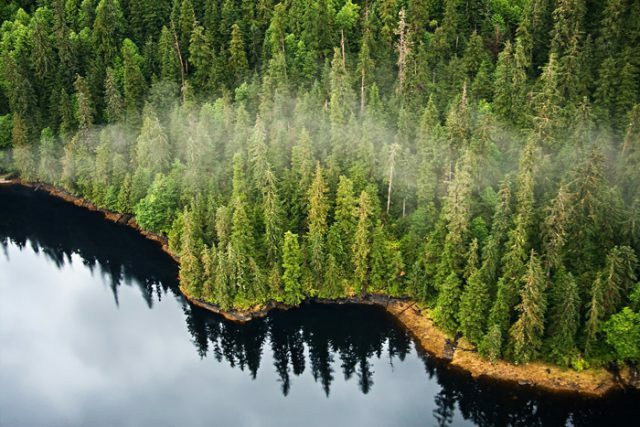 The decision has now, for the second time, stopped four Tongass National Forest logging projects. Crag has represented Greenpeace and Cascadia Wildlands in litigating these projects since 2008. The case focuses on a model the Forest Service uses for determining whether old-growth forest habitat has the ability to sustain deer populations beyond what is needed to support Alexander Archipelago wolf populations and subsistence deer hunting, so that forest could then be sacrificed to logging, a long-term loss of old-growth habitat. The Tongass Forest Plan – the official standards the Forest Service is obligated to follow in planning timber sales – specifies a winter habitat capacity for 18 deer per square mile, is the threshold for making this determination. The areas in which the Forest Service planned the four projects already fall far short of that requirement. This case is one of several where Crag is providing legal expertise in support of efforts to protect the wolves of Southeast Alaska and the old-growth habitat upon which they rely. Crag recently filed another suit challenging proposed timber sales in the range of the Alexander Archipelago wolf. Crag is happy to celebrate this victory together with our clients Greenpeace and Cascadia Wildlands, and with our supporters in this effort, the McIntosh Foundation and the Boat Company, which does eco-tours in Southeast Alaska. Read the local news coverage here and press release here.